In June’s issue of the ATA Chronicle, Jiri Stejskal announced in the President’s column that the ATA Board had declared crowdsourcing one of the two top threats to the profession and to the association, at the same level as the other top threat they identified, the economic downturn. This new trend—and the perception that this is just one more modern variation on the age-old theme of using unskilled, low-cost labor to produce translations—has engendered a strong reaction in the translation community. The most notable example is the controversy that arose after LinkedIn surveyed members, asking if they would be willing to contribute translations to the website for compensation such as account upgrades, recognition, or just for fun. The ATA quickly responded with a press release and open letter to LinkedIn, and the New York Times covered the resulting outcry, describing translators variously as “irked,” “surprised,” “upset,” “annoyed,” and in one case, “excited” about the opportunity for public credit. Concerns about crowdsourcing in the realm of translation come from several angles. First, there is the concern about translation quality, and the public perception of what it takes to produce quality translation. While this is in some ways a simple desire to see quality writing and translations in the world, and a desire to enable speakers of multiple languages to gain meaningful access to information, products and services, behind this concern also lies another: that the propagation of amateur translations will degrade respect for the profession, and that it reflects an existing lack of respect. There is also the fear, plain and simple, of losing work, and what could be the depreciating value of the education and professional skills that translators have invested in over so many years. Along with that is the frustration that the continual task of educating clients, and potential clients, can sometimes seem to get more difficult, rather than easier. Public enthusiasm for new ways to rally non-professionals around translation activities can be seen as yet another nail in the coffin of the dream of linguistic awareness among clients and the public at large. How can translators hope to educate clients about the value of professional translation when all around them they see amateurs creating translations for major companies? Last but not least, there is an ethical concern, as expressed by one of the December NCTA General Meeting participants, that companies stand to profit from volunteer labor. When corporations crowdsource the design of a logo to “the crowd,” or crowdsource the creation of a marketing video for their product, and proceed to profit from these creations, are the relatively small rewards (if any) that are offered adequate and appropriate? When companies such as Facebook stand to profit from the expanded markets that translators help them build, is it ethical for these contributors to receive only electronic badges and non-monetary rewards? WHEN IS IT APPROPRIATE AND EFFECTIVE? In our talk at the December General Meeting, Idem Translation’s Monica Moreno and I addressed some of the above issues, most notably that translation crowdsourcing is likely to “expand the pie” rather than take away existing work. With respect specifically to the concerns about quality, client education, and ethics, the answers may be more complex. Like any other methodology, there are times when crowdsourcing is an effective and appropriate approach and times when it is not. Furthermore, just as there are successful and unsuccessful approaches to identifying good resources and managing translation projects through traditional processes, there is a broad spectrum of successful strategies for crowdsourcing that can yield translations at appropriate quality, speed, volume, and consistency—as well as a spectrum of unsuccessful strategies. As Jost Zetzsche wrote in the October edition of the Tool Kit, there is an opportunity for the translation community to use its “unmatched expertise [and] good track record” to take on leadership roles to help shape this trend and potentially learn from it, rather than turning our backs on it. 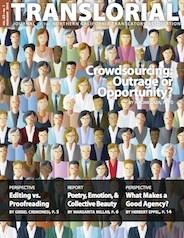 I suggest that an effective response to the growing trend toward crowdsourcing translations is for the professional translation community to discuss criteria for the appropriate uses for crowdsourcing, and effective approaches, and be prepared as an industry and as individuals to educate clients and the public, as we do with other issues affecting our profession. High-stakes content should be carefully translated by a professional, because even a minor error can cause major brand damage or significant lost business. For business cards, quality matters, and it absolutely matters for every word. Short texts, and business cards in particular, are notoriously difficult to translate, lacking context and requiring a professional who will ask the right questions to be able to translate meaning appropriately. For short texts, one could also ask if the money saved is significant enough to justify any trade-offs. Business cards are a tool for branding—of the company and the individual the card represents. Titles convey more than just meaning (and often convey very little meaning); they convey rank, and need to be positioned within the context of other titles at the company and in the industry. In a second case, why did LinkedIn’s strategy inspire such indignation? I would argue that it was primarily because they did not know their community. What many have called an undiplomatic outreach effort was indeed insensitive and unwise—specifically, it showed LinkedIn’s lack of preparation in understanding who their community of users is and what they expect from the site, and a lack of respect in how they approached them. One of the volunteers' dashboard page. What are some positive criteria that we could use to educate translation users, to help gauge effective and appropriate use of translation crowdsourcing? Know your crowd. For crowdsourcing to work, your organization or company must inspire a large community of users to participate in a project. Successful projects are built on existing communities, social causes, or a linguistic challenge. Select material for crowdsourcing that lends itself to community input. Your users may know your product best, so enable them to contribute their translations of your unique content. Assess whether the material is high-stakes for your organization, whether there is enough content to make building a crowd worthwhile, and always provide context. Legal and other documents requiring domain expertise are best left to professionals. Assess your organization’s quality needs and create a plan for achieving the quality standards you set. You may need the services of a professional translator to help with defining quality standards, and you will derive maximum benefit from the wisdom of the crowd when your tools support collaboration and feedback. Many companies contract professionals to review the final crowd-produced translations. Ensure adequate resources to manage the crowd and support the technology infrastructure used by the crowd. Active communities require active support, and large communities require scalable infrastructure to enable community members to support each other and to encourage leaders to emerge. Assess your organization’s resources realistically against the volume you need translated, the number of target languages you hope to achieve, and the costs of facilitating crowdsourced translations. Be prepared to recognize and/or compensate contributors. Depending on the project and the motivations of the crowd, you should be prepared to publicly credit contributors and, under some circumstances, compensate them financially. To help determine appropriate compensation, consider whether the organization and project are for-profit or not-for-profit, and how much non-financial benefit users derive from participating in the project. Invest in professional quality control. For key languages, and key content, contract qualified translators to review the crowd’s work and approve it before publication or release. Contract professional resources to vet members of the crowd before they begin contributing. Give back to the community. If individual contributors are not compensated financially, take note of which communities are contributing and find ways to give back. If the professional translation community supports your work, support local translation organizations and professional development. If your crowd helped you build a new social network in Haiti and among the Haitian-American community, consider how you might contribute to that community. Build on the community’s experience of translation. For newcomers to the field, guide them through the new experience of encountering translation challenges. Offer resources to build basic skills and help them locate paths to professionalization. Provide an entry point for translation students seeking to gain practical experience. Provide feedback to build the crowd’s skill level and understanding of translation techniques. As translation crowdsourcing programs continue to emerge, the professional translation community could benefit from continuing this conversation, adding to and refining a criteria list, and examining how projects measure up. In Northern California, we have a unique opportunity to watch this trend in the technology sector. Nina posted this article under Agencies, Translation	on Monday, February 1st, 2010 at 12:09 pm	You can follow any responses to this entry through the RSS 2.0 feed. Both comments and pings are currently closed. Next Article → THE TRANSMUG REPORT WORDFAST ON WORD. THE RETURN?